ED: I'm coming from California. I just flew in a several days ago from the New York Jazz festival. It's amazing time here. hbh: And then you lived in Florida? Did you make a musical education as student? ED: Yes. I played the sax, when I was ten years old and I joined that group called America's Youngest Jazz Band, when I was eleven, and travelled all over the world with this group. The age was five to twelve. A great group of young musicians. And once I finished playing with that group, I studied music at school in Florida and also studied music and business at University of South Florida. hbh: What is your specialty? The tenor or the soprano sax? ED: I probably say, the alto. The alto saxophone is the instrument I studied on. So that's the voice I identify the most. I love the tenor and also the soprano, but I play most the alto and I play quite a bit tenor also. hbh: It's not so difficult to blow alto than a tenor. ED: I think it's about the same. I mean the tenor is a little bigger, so it requires a lot of more air. But they are very very similar to me. hbh: You are now in the smooth jazz scene since a long time. You have a great name. hbh: Where do you play? At which venues? ED: All over the country. Really! I'm gonna be perform at the Catalina Jazz Festival, which is in California. I'm just touring all over the world. I have performed in New York. Had an incredible time. I'm also going to be at the Thornton Winery, in Temecula in California. I'm going to Barbados next month. Really, it's all over the place. hbh: How did they contact you? ED: They contact to my booking agency and they want me to perform at their venues. It's great. hbh: Let's speak about your albums. hbh: How did it start? ED: The first album I released is called Cruisin'. I released it independently. My dad was my manager. So when I was about sixteen years old, I started writing music for my album. When it was released, I was seventeen. I was still on High School. We distributed it locally in Florida and when I performed I sold my CDs. But it was until I was twenty years old, I got a record deal. Higher Octave signed me to their label and I released my national debut album Night On The Town in 2004. And since then I released three more albums. ED: Just Getting Started came out in 2006 on Narada Jazz and Goin’ All Out came out in 2008 on Blue Note. On A Mission is my latest album and came out in 2010 and that was on Shanachie. Now I am working on a new album. hbh: Do you have a two-albums-contract with Shanachie? ED: Not at the moment. Right now I am in between deals. I try to figure out, where I am going next. I'm really excited about the new music working on. hbh: There are not many labels still contributing smooth jazz music. ED: Not as many as it used to be. It's definitely getting a lot smaller. But the good news are, there are still labels out there, that are pushing their artists. It's really the matter to find the right label and working with the right people. hbh: That is your great task, to find the right label. hbh: I think about some labels, Heads Up for example. hbh: They had many jazz musicians or Warner Jazz. ED: Yeah, they were great one. hbh: Or Narada Jazz. They had all reduced their jazz realm. ED: Most of the market isn't even around any more. Narada Jazz is gone, Warner Brothers Jazz division is gone. So it's definitely shrinking. But I think, now with the Internet technology a lot of artists are doing things independently now. ITunes and Amazon and all the social networking like Facebook and Twitter, now artists can reach directly to the fans, which is a whole new thing for the music business. hbh: But the problem is to get paid. hbh: Most of the people are downloading illegally. hbh: It's a great problem for the artists to get their music distributed and sold. hbh: So to sell an album as independent is highly risky. hbh: Because the first one will pay, the next one will only download. ED: Right! Exactly! It's definitely challenging. I think it's an interesting time in music business because everything is changing. Nobody really knows where it's gonna go in a few years from now. But everybody is just being creative and still releasing music. I guess in a few years we see where everything goes. But fortunately the fans are still there, you know. We do these festivals and perform before different audiences. They are still there. Their interest in music is there. We need to find more ways to get the music to them. hbh: This is a real problem, because many festivals are gone. I think about the Award festival. ED: Yes, the Oasis Smooth Jazz Award Festival. They had done that huge concert production. hbh: They cancelled the whole show. Many people had ordered hotel and flight and so on. And just several days before the show, they cancelled the whole show. Some artists made a lemonade party. hbh: You heard about it? ED: Yeah, I heard about it. hbh: This is only one show. Several didn't started again. I think, the decline of the radio stations has produced a great hole. You cannot promote such festival anymore. hbh: I think the market in total has changed. ED: Yes. It has. Unfortunately radio was a great source for promoting artists, for up and coming art, for promoting new music and for promoting shows. And now without that vehicle there is a big void. Now many people don't know where to go, to find out about new shows, to find out what albums are coming out. So they go to the Internet but it's definetely not the same thing than having radio. It's definetely very challenging. I have definetely seen the decline over the past five years. But hopefully the genre continue to grow. People continue to support smooth jazz. And a few years from now shall turn around and see stations again. And smooth jazz can grow again. But it's been very difficult times. hbh: I think some of the big festivals are still there and well visited like Boscov's Berklee Jazz Festival. This is a big name. Many visitors. They know when it is. Or the Capital Jazz Festival. ED: Capital Jazz Festival is very successful. hbh: But the smaller ones. They have no big name and are in trouble. hbh: Let's speak about something more positive. ED: Yeah. The good stuff (laughing). hbh: Let's speak about your latest album. ED: The latest album was called On A Mission and came out in 2010. ED: . with the glasses and the big saxophone (laughing). The cool thing is, every album I release, I try to do something different. You know, I am always looking at my music and how can I be more creative. I do something new, I haven't done before. With this latest album is definitely more elements of pop. There is hip-hop, there is reggae, there is a little bit of everything. I like to play music that appeals to everyone. So when I was putting the album together I was thinking who can I work with that gonna compliment that direction of music I want to go to. So Rick Braun was one of them I really wanted to work with. We recorded a song together by Herbie Hancock called Butterfly. It was a great workin' with him. He is an incredible musician and we had a great time in the studio. hbh: He's a real pro. ED: Absolutely! And a great guy. We had so much fun recording in the studio. I also got to work with James Lloyd from Pieces Of A Dream. He wrote a song. ED: An incredible keyboard player. He produces a lot of music outside Pieces Of A Dream. We did a song together called Uptown Swagger, which is actually the title track. That was actually my first single of On A Mission. I also worked with Natalie "The Floacist" Stuart. She is from the group Floetry. An incredible vocalist. Yeah, I had such a great time to work with so many incredible artists on my last album. And I think, every person I worked with, brought their own style and sound, which made the album what it is. hbh: That album was released in 2010 and do you already plan a new album? ED: Yes, I am planning actually right now, I am writing new music and put things together for that next project. I am not sure, when it will be released. May be the late fall this year, may be October, but it's definitely scheduled before the beginning of the year 2013.
hbh: What is your idea to separate from other smooth jazz saxophonists. There are so many. ED: There are many (laughing). One thing that already sets me apart is, I'm younger than a lot of my contemporaries. I try to make music that also appeals to younger people and I think that's definitely something that is important. Five, ten years from now, it's gonna be the younger generation that carry the smooth jazz tradition on. So with a lot music I write, there is a lot of pop, there is R&B, there is hip-hop, elements people my age and younger are listen to. So I love to collaborate with more R&B artists, with vocalists, may be with like a rapper. Which really diversify my music, so that I really reach out to the younger demographic and introduce them to jazz. So five, ten years from now we have a lot of new younger people getting into this music. hbh: ..like Brian Culbertson did and many other artists. ED: That is a lot of guys are doing now. They definitely see the need to reach out to other audiences and tapping to the younger demographic. You know, a lot of smooth jazz not really appeal to them. Someone who listens to Usher or Beyonce is not gonna go buy a Kenny G album. So if you take an artists like Usher and Beyonce and collaborate with them and make a song, then it appeals to everyone. So I think that's definitely an important factor that a lot of artists are considering now to collaborate with other artists to diversify the music. hbh: I have listened to several artists, who played in the band of Beyonce. But most of them are jazz artists. hbh: They don't play smooth jazz, they play straight-ahead jazz. I thought they would use the crossover effect to include it for their own work, but instead they are playing straight-ahead jazz. What is your opinion? You have certainly seen Jeff Lorber. He is playing Galaxy. Galaxy is jazz fusion. And his album He Has A Hat is also straight-ahead jazz. It's a return to the jazz fusion like other artists for example Chuck Loeb with his latest album did. Or take for example George Benson's Guitar Man. ED: Guitar Man. Going' back to the roots (laughing). hbh: What do you think about that? ED: I think it's great. You know, about the past twenty years jazz is definitely been forgotten in America. We live in a culture, where people are more interested in pop. You know, it's unfortunate. There are a lot of artists like the George Bensons, the Chuck Loebs and all the other incredible musicians, that are doing everything they can do to preserve the legacy of jazz. So they are going to, where jazz started and bringing that music back. I think it's great. hbh: Do you think, they can do it because they are legends? They have great names. So they can play in that niche? ED: I think so. Guys are definitely more established. They have definitely a name for themselves and they are doing it for a long time. They have more opportunities to create whatever kind of music that is what they want do. You know, someone like George Benson, he is one of the inventors of smooth jazz and he can play every kind of music he wants like to play. And the great things is, he has his fans and they gonna listen and support his music regardless what he is playing. ED: All his popular hits. hbh: ..Give Me the Night. You know, people are dancing on. He will never play jazz music or fusion jazz. ED: Yes, it's very interesting. I mean from recording to a live show, there is a big disconnect. When it comes to radio, their program is a certain sound, that they play on their radio. That's not the same thing, you see live. It's kind of hard, because artists try to find that balance appealing to the people they hear on the radio and also appealing to the fans that see them live. So it's really tough to find that right balance. I know George Benson, he has written so many hits over the years. When the fans come to his how, that's what they wanna hear. Whether it's George Benson or another straight ahead player, which is all standards or classic. These people come to hear On Broadway and Masquerade and all of his other songs. So, I think it's a lot of other artists in general are struggling with to find the right balance. It's tough. You can't please everyone. But on the end of the day the fans buy your tickets and support your career. So you have to give them what they want. ED: Sounds that people all know. hbh: That's music of Bill Withers or Grover Washington Jr., The Two Of Us, Winelight or other renditions. Somehow I regret that the compositional element is lacking. There are great musicians, who can play very professionally. But to write a good composition is another task. ED: Yeah. I mean, I am writing my own music since I am twelve years old. I am personally like to play personal compositions. Every now and then I play a cover song everybody knows and connect to identify with. But to me personally originality is important. And I think at the end of the day, when it comes to this music, that's what the music keeps going. New music, fresh ideas, new compositions. You know, I think it's great, that some artists are playing covers. But I think originality is starting .. It's missing now from this music, because there are so many covers out there. I think, it's to get back to writing your own music again. Fresh ideas, new songs, original compositions that's definitely I choice to do with my music. To write and create new ideas. Just to keep that going. And I think a lot of other artists need to do the same thing, because that helps the genre to grow, when there are new ideas and creative fresh music. hbh: Did you hear any good composition of smooth jazz artists in the last twelve months? hbh: Do you remember and say, wow what a great composition? ED: I wouldn't say, it isn't necessary smooth jazz, but Esperanza Spalding just recorded a new album. It's called Radio Music Society. A great album. Very original. It's exciting to see an artist like that. hbh: But it's a cover album! She's playing pop hits. ED: Not all of them (laughing). There is a few. Robert Glasper, an incredible piano player. He just released an album called Black Radio which is all original. I think there is a cover called Afro Blue, but the most are originals. I was blown away. I mean, it's so much originality, so much personality. Most different from everything, what is out there. hbh: Can I speak about other saxophonists? hbh: What do you think about Kirk Whalum? ED: Kirk Whalum is one of my favorite saxophonists for a long time. My dad first introduced me into Kirk Whalum's music about fifteen, sixteen years ago and I love his sound. I think he has probably the most distinguished tenor sound. He is an incredible guy, incredible person, great musician. I would personally love to hear more his original compositions. I know, lately he has been doing a lot of covers. I think he recently did a rendition of John Coltrane and Johnny Hartman. Just a new album with that music and some other covers. I think it's great but the magic in Kirk's music is his originals which I love to hear more of. hbh: He plays two genres. One is smooth jazz and the other is gospel. hbh: For example Africa, Jesus, Africa. A great song. ED: Yeah, a great song (laughing). hbh: He makes worships. 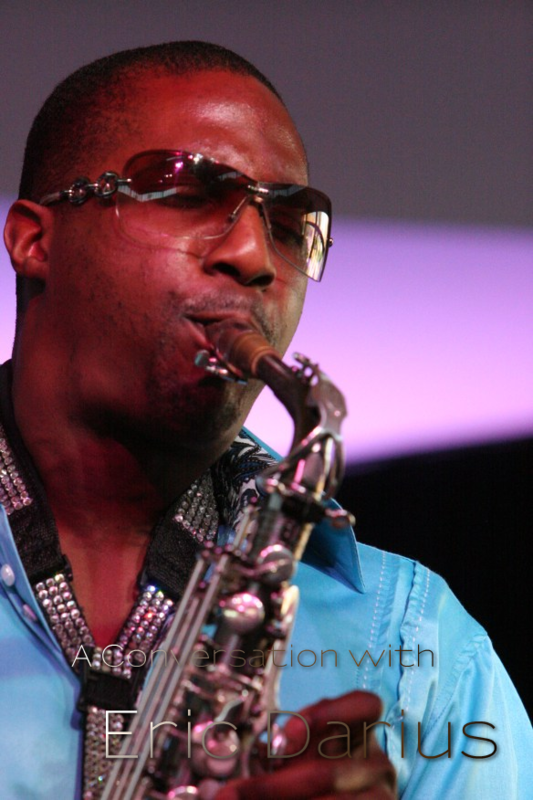 Are there other influential saxophonists or your idols? ED: Many (laughing). I mean, if I go back to the beginning. For me the first saxophonists that I heard, I was completely blown away, when I was young, were David Sanborn, Grover Washington Jr. and after that it was Kirk Whalum and Gerald Albright. Once I got to High School I understood more about traditional jazz. Then I started to listen to John Coltrane, Charlie Parker, Cannonball Alderly and then I got to contemporary jazz and really started to listen to Kenny Gareth, Michael Brecker. What I mean, the list goes on and on. But those are definitely my most favorite saxophone players. hbh: You prefer their technique but not their music. You didn't transfer their music in your own work. ED: No. That's the thing. I don't want to sound like them. You know, I listen to their music and transcribe a lot of their stuff. I learned exactly what they play. But I don't change that for my music, I want to play original separate from theirs. And that what great is. All their sound and styles and music is so different. It's important that every artist has his own distinct sound and originality. So I don't necessary sound like the other guys. They are all influences on me and my music. hbh: Since when are you touring, since when are you doing concerts? ED: All year long. I am touring since the beginning of this year. Continue ..
hbh: No. Since which age? ED: Oh. I started touring, when I was in college, twenty years old. And then I really started national things. I mean I was trying here and there with my school band. We performed in New York with my soloists. When I was eleven years old I performed in Switzerland, but I was touring with my own group playing my own music, when I was twenty years old. hbh: Did you also perform on the Montreux Festival? hbh: How was your impression there? There was something about seeing people of another country, that don't speak my language, seeing them smiling and dancing and clapping and having a great time. And music is just that language we all share. That what connected us together. And I realized that how powerful music was. That I realized I wanna to do. hbh: Yes, I attended your concert. I have seen how full of energy you are performing. You are changing your attitude every second. hbh: How do you have this power to stand such a concert over such a long time? ED: I think it's very important to stay physically in shape and in condition. I try to build in gym and stay active and fit as much as possible. When I was actually in school I did sports and music. So on top of playing the marching band, the jazz band, the jazz combo I was in the basket ball team, soccer team and track team. So it was very important for me, that I was running, because that helps of my wind and lung condition and when it comes to perform on the stage I have all this energy and endurance. I get a lot of my energy from the audience. When I see people dancing and really getting into the music. That gives me that extra boost. I feel all the crowd's energy and that's really what it all is. That special synergy that happens. hbh: Do you see a difference between the American and the European audience? I was get asked that really intelligent questions asking me about specific songs, chord changes and about soloing. And about things people don't normally asked me. It's really interesting that it's culturally different here. I loved that about here. hbh: So they asked you about intro, bridge, chorus, the complete intonation and so on. hbh: But there is also a different behavior. The Europeans are more solid, the Americans are more cheering and dancing. ED: Yes. Right. And I noticed something definitely also. I think it's a cultural thing. Even like when I perform in Japan. Nobody is dancing and clapping. They are just very serious. But they are really listening and they appreciate it. You know, as an artist you have to adapt your crowds. For me my job is to make sure, everybody has a good time, that they are smiling and dancing and just enjoying. That came from watching people like Michael Jackson performing, Prince and James Brown. They were entertainers. Apart from being a saxophone player I want to entertain people. hbh: It also depends of the venue. When you play in Spaghettini for example people are eating, drinking, there is noise in the background, when you perform. Is that disturbing? ED: It's a different environment, when I play in a place like that. But really you have just to command people's attention, with which you are doing onstage. Don't stop and listen. Know listen what you are doing. But you really have to adapt every environment and every situation, because they are all different. But really for me I love being onstage, I love performing in front of people and I want to bring joy to the people with my performance. hbh: Do you have special tricks to involve the audience? Stand Up, make an echo from the people, make the first refrain? hbh: Is that a technique you learned from other artists during your touring? ED: It's kind of my stage show, which kind of evolved in the time from my experiences seeing other people perform. When I grew up, I loved watching Michael Jackson and Prince and Stevie Wonder and James Brown perform. Just when they engaged the audience. hbh: Did you play with Stevie Wonder? ED: No. He is definitely someone I love the opportunity to perform with. But I have played with Prince (laughing). hbh: Prince is also a great artist. I have heard that Stevie Wonder is going to jazz concerts and then he stages in. ED: Yes, he did that recently in California at the Jazz Fest West. He wasn't catch to perform and to be there and he showed up and ended performing onstage with all of the artists, which were there that day. So that was really cool! I wasn't there unfortunately. hbh: I'm admiring that he can just play a piece he never played before or were it all jazz standards, everybody can play? Like Watermelon man, that is a jazz standard, many can manage. ED: Right. That the thing. A lot of people think, that smooth jazz artists can only play one thing, but a lot are versatile. And for a lot of smooth jazz artists their foundation is traditional jazz. For me that what it was. I was playing John Coltrane, Cannonball Adderley before I played smooth jazz. hbh: ...or rock music like Jeff Golub. ED: Exactly. David Sanborn played with a lot of rock bands. So I think the jazz artists are very versatile. hbh: I recently have spoken with Dave McMurray from Detroit. He is performing with Bob James, the Bob James Trio. Jazz, more straight ahead jazz. And on the other side he is performing with Kid Rock. ED: Yes, let's some perform with Kid Rock (laughing). hbh: Are you also engaged with such artists outside your genre? ED: That's what I am working on right now. Definitely collaborating with other artists outside of jazz. And that with my music I want to incorporate other genres and styles and working with people outside of jazz just to broaden my appeal. I don't wanna just reach jazzists and switch to people in general. So I love to work with different people outside of jazz also. hbh: You have played with Prince. What was your experience with Prince? How did you come in connection with him? ED: I was a good friend with a lot of guys in his band. He was doing a stint in the 3121 club in Rio (Grand Hotel) in Las Vegas. For a six months period he was there every day. I was going to Las Vegas to visit or had another performance there. And I called my friends. They said they would performing later with Prince. Just come and stop by. They got his permission for me to come up onstage and I was playing with all of them. It was incredible. hbh: Was that just one opportunity for one day or did you play later with him again? ED: Just one opportunity but I am definitely hoping that there will be more. I love playing with him. hbh: That is the big music business. hbh: What plans do you have for your future now? ED: Continue touring, working on a new album and producing and really reaching the younger people. That is my passion to see young people into this genre. I actually started a new campaign called On A Mission in the schools. I am going to a lot of Elementary, Middle and High Schools all over the world and just to inspire kids to play instruments, because in America with all the budget cuts of the economy the schools are suffering. So a lot of kids don't have music programs in the schools. I try everything I can do to support the music school system and encourage kids play music instruments. hbh: That is a Pro Bono project? ED: Yeah. Absolutely! That is just something I have a passion for. I just want to make everything I can do to make a difference with the younger people. I think they need it. A lot of kids get no opportunities to play instruments anymore because they don't have a music program. hbh: Do you also want to jump in the teaching opportunity like for example Walter Beasley? He is playing in Berklee as teacher or Richard Smith, he is guitarist at the USC. ED: I don't see myself at the university as a professor but more so as a mentor to kids and going to different schools performing for kids and just inspiring them. You know, who knows down the road what happens. I definitely will continue doing that and try to support the youth. hbh: It's very difficult to have a full-day job as musician today's. ED: Yeah. It's not as easy as it used to be. But I can definitely say, I am very blessed and fortunate, that what I get to do. I can't do anything else. Music is my life. I am always has been. I never had a regular job (laughing). I am always performing since I am young. hbh: So this is your decision. To stay as a full-professional musician. hbh: I wish you much luck for the future! ED: Thank you very much! hbh: Thank you for the interview. ED: My pleasure. Thanks for having me and I look forward for the next time.